Good morning! 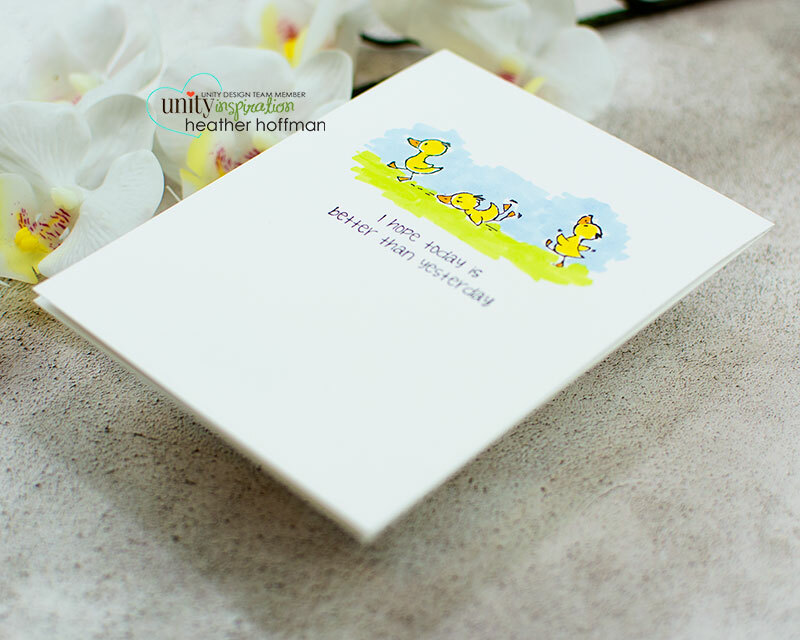 Heather here with the next card in my series featuring Clean and Simple techniques! This week’s technique features some adorable tiny images from Precious and Sweet, and the perfect and hilarious sentiment from Every Single Day – the June 2018 Sentiment Kit! Using tiny images as a focal point on your card is a great way to pack some punch with the meaning of your card, but also still leave lots of white space in the surrounding area. Besides…could those little ducks be ANY cuter?!?!? Pairing up the perfect sentiment to really enhance your images is also super helpful! Can you see how much more punch is added to this card with the combination of that image with that particular sentiment? And as a bonus, it is also super easy to step up a CAS card with a couple more layers and colors. This second card is another I made using the exact same image and coloring, but this time adding a die cut frame around it and a blue cardbase. I also popped the frame up on a bit of foam adhesive for some added dimension. Which way do you prefer this card? Super clean and simple, or the stepped up version with more layers?